Lisa McInerney was born in 1981 and just about grew up to be a writer of contemporary fiction. 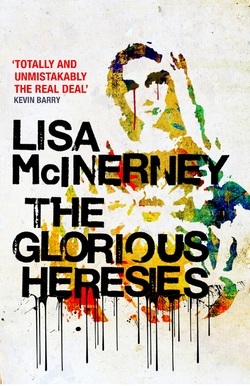 The Glorious Heresies is her first novel. In 2013 her story ‘Saturday, Boring’ was published in Faber’s ‘Town and Country’ anthology, edited by Kevin Barry. ‘Arse End of Ireland’, her take on life in a Galway council estate, won Best Humour at the Irish Blog Awards in 2009, which was a surprise as she wasn’t aware she was being particularly funny at the time. Lisa lives in Galway with a husband, a daughter, and a dog called Angua. Brilliant. Alarming. Satisfying. Mollifying. And strange. It’s quite difficult to get my head around the concept of it being available to readers. For so long it was a complicated secret shared by me, my agent and my editor. Has anything surprised you about readers’ initial reactions to the novel? The warmth, really. I think if you spend long enough prepping a novel for publication you stop being able to evaluate its charms. That people are loving it comes as a very pleasant shock. The Glorious Heresies is a great title; how did you come up with it? Most obviously it’s a pun on the Glorious Mysteries of the Rosary, with an extra twist towards acknowledging the deeds of my characters. Maureen, who I like to think is the chief heretic, commits a grand deed when she kills an intruder with a religious ornament, setting off a chain of terrible acts and decisions of cumulative intensity. And on a quieter, less obvious note, Ryan says in the opening pages that any lapse in attention is heresy, considering his religious devotion to his girlfriend, Karine. Your use of language is magnificent. How did you learn to write? Alas that my answer will be as underwhelming as the compliment is overwhelming. I have no idea. I’ve always written and I’ve never put too much thought into technique or to academic dissection of the words that end up on the page. I don’t think writing is something that can be learned. It’s a capacity for a certain kind of communication, picked up primarily through a love of reading. I think it can certainly be honed, though the base talent is very close to innate. I loved how your characters’ lives continually intersect. Was it a challenge to keep track of their different trajectories as you were writing, and how did you do so? I started off thinking that I should maintain some sort of flow chart. I abandoned it an hour later. I’m not a very organised writer in that sense; I let the characters lead me. I think if you pay close attention to your characters needs, desires and flaws, the plot will be very hard to lose. Which of your antiheroes is your favourite? I enjoyed how the apparently minor incident of Tony disposing of his son’s piano comes to symbolise the difficulty, within a brutalising culture, of maintaining a sensitive side. Do the arts have a humanising effect and would Ryan have been able to stay on the straight and narrow if he’d been allowed to continue playing the piano? The arts certainly have a humanising effect, for what are we at all if we can’t dream or create? Art makes us human. Though I would say that, wouldn’t I? As for Ryan’s situation, who knows? The decision was made for him and he has no way of telling how it would have worked out with any alternate scenario. He can certainly hold a grudge, for all the good it does him. As wonderful as the arts are, I don’t think it’s realistic to think that creativity counters chaos. It’s not one or the other. In fact, they coexist quite nicely, usually. I saw one of your tweets saying you’d signed a copy for one of your ex-teachers, a nun. Would Catholics be offended by your novel? It depends on the Catholic. The Church gets quite a bashing in Heresies, especially through Maureen’s eyes, but it’s well-deserved; historically, it’s done incredible damage to Ireland and to our collective psyche. That said, most of the people of faith that my cast encounters are moderate, well-meaning and frequently bewildered by what my characters put to them. Maureen, in particular, keeps assigning a fanaticism to religious people that doesn’t correspond with the real world at all. I think Maureen comes out of most of her encounters looking much more obsessive and warped than the Church she thinks she’s battling. The character Maureen makes some interesting points about the interdependency of saints and sinners and women’s collusion in perpetuating social structures that damage them. Is she right? What did you most enjoy about writing The Glorious Heresies and what did you find most challenging? I think Ryan’s first person interludes came easiest. Some of Georgie’s stuff I found quite challenging as it’s easy to get frustrated with someone so determined to stay wounded; she’s quite pig-headed in her victimhood, really. And – I’m trying not to spoil things for anyone! – writing Tara’s interactions with Ryan was particularly difficult. She made me want to scrub my brain clean. There’s not much I can say! My agent handled the selling of it and I’m not the kind of writer who chases regular updates; he kept me up to speed with indications of strong interest, but otherwise I left him to it and got on with writing Novel 2. But I felt strongly then - and know now - that John Murray was the right choice. I have a fantastic editor with whom I work very well and I feel like I’m “home”. Tell us something about your writing process: for example, are you a planner or a pantster, and do you have any particular writing quirks? I spend most of the time playing Solitaire and looking out the window, with occasional bursts of wordage. I don’t finish for the day until I’ve done at least 1k words, though when it’s going well I’ll aim for 5k over a two-day period. And no, I never plan. It’s all very character-led, organic and pretty risky, I suppose. That’s not to say we didn’t fiddle with plot here and there during the editing process! Jokes aside, I don’t believe in taking or giving writing advice. Every writer’s different. I think there’s a massive danger in setting out too many rules. It risks telling the writer “You’re doing it wrong!” Are you getting words on a page? Yes? Then you’re not doing it wrong. I absolutely detest the notion that a writer must write every day. I’m pruning words from Novel 2, which will be published by John Murray but as yet remains nameless. Ella Minnow Pea. But alas, Mark Dunn wrote it already.